Where do I find my license code/key? If you have Bellows – WordPress Accordion Menu installed on your site, you’ll automatically see an extra option visible when you go to duplicate your menu. By default, the option is checked, but you can disable this if you like. If your source menu items contain any Bellows widget areas, the Duplicator will automatically duplicate these widget areas, as well as the widgets inside them if you enable this option. 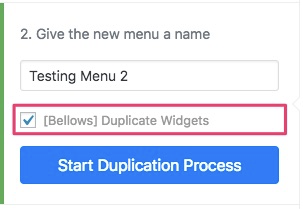 The Duplicator will automatically trigger Bellows to re-generate any custom menu item styles for the duplicated menu – this is important for individual menu item custom styles as the items in the new menus will have new IDs. Please note that any hand-coded custom styles will need to be copied manually and their IDs updated. (A better solution may be to use custom CSS classes that you can then re-use across menus and maintain just a single style).